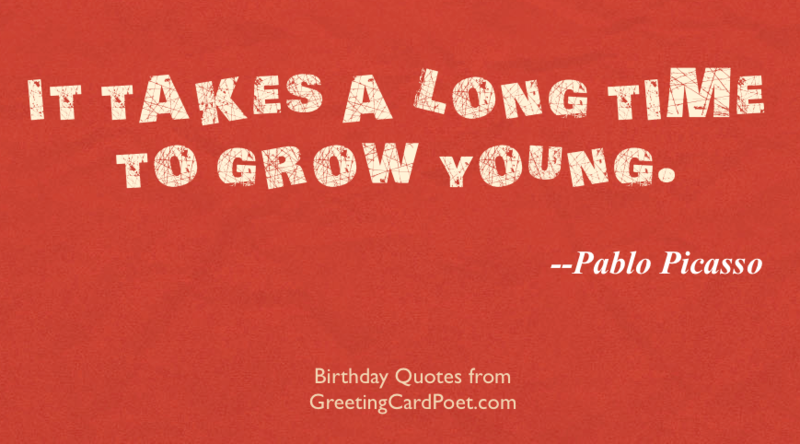 Check out this long list of birthday quotes. There’s something for everyone – from the inspirational to the funny, and everything in between. Enjoy! When I passed forty I dropped pretense, ‘cause men like women who got some sense. There are days of oldness, and then one gets young again. At seventy-seven it is time to be earnest. You’re not getting older; you’re just getting better. Life is a hereditary disease. Include a clean joke on your birthday card or message. Cherish all you happy moments: they make a fine cushion for old age. Most people die at 25 and aren’t buried until they’re 75. Each ten years of a man’s life has its own fortunes, its own hopes, its own desires. Happiness in the older years of life, like happiness in every year of life, is a matter of choice — your choice for yourself. Messages for your niece’s birthday. Regardless of your age, you will always have adventures, unexpected joys and unexpected sorrows. You’ve logged so many miles in the voyage of life that you’ve been upgraded to first class! Take care of the minutes, and the hours will take care of themselves. Death borders upon our birth, and our cradle stands in the grave. Our birth is nothing but our death begun. Sixteen candles make a lovely light, but not as bright as your eyes tonight. Age does not protect you from loving. But love, to some extent, protects you from age. When I was 24, 44 seemed like 104! But my strengths now come from experience. I feel like I’ve come into my own. Rule for Happiness: Something to do, Someone to love, Something to hope for. Happiness is perfume, you can’t pour it on somebody else without getting a few drops on yourself. Nobility is not a birthright. It is defined by one’s actions. Our birth is but a sleep and a forgetting; The soul that rises with us, our life’s star, Hath had elsewhere its setting, And cometh from afar; Not in entire forgetfulness, And not in utter nakedness, But trailing clouds of glory do we come from God, who is our home. Why not think about times to come, And not about the things that you’ve done. Here’s a posy of flowers, and a basket too, with Birthday greetings all for you. Sugar in the gourd and honey in the horn, I never was so happy since the hour I was born. Every human being on this earth is born with a tragedy, and it isn’t original sin. He’s born with the tragedy that he has to grow up — a lot of people don’t have the courage to do it. Most of us can remember a time when a birthday – especially if it was one’s own brightened the world as if a second sun has risen. It is through the idealism of youth that man catches sight of truth, and in that idealism he possesses a wealth which he must never exchange for anything else. Time draweth wrinkles in a fair face, but addeth fresh colors to a fast friend. Find out more about these fun and colorful birthday certificates by clicking on the image above. Thirty, thirty-five, forty, all had come to visit her like admonitory relatives, and all had slipped away without a trace, without a sound, and now, once again, she was waiting. A man of forty today has nothing to worry him but falling hair, inability to button the top button, failing vision, shortness of breath, a tendency of the collar to shut off all breathing, trembling of the kidneys to whatever tune the orchestra is playing, and a general sense of giddiness when the matter of rent is brought up. Forty is Life’s Golden Age. No one over thirty-five is worth meeting who has not something to teach us, – something more than we could learn by ourselves, from a book. You take all the experience and judgement of men over fifty out of the world and there wouldn’t be enough left to run it. Friendship is the shadow of the evening, which strengthens with the setting sun of life. A friendship counting nearly forty years is the finest kind of shade tree I know. Birth may be a matter of a moment, but it is a unique one. What I wouldn’t give to be seventy again! A man is old when he can pass an apple orchard and not remember the stomachache. Once I was looking through the kitchen window at dusk and I saw an old woman looking in. Suddenly the light changed and I realized that the old woman was myself. you see, it all happens on the outside; inside one doesn’t change. William Randolph Hearst, when commenting on suggestions for birthday gifts. To see a young couple loving each other is no wonder, but to see an old couple loving each other is the best sight of all. One should never trust a woman who tells her real age. A woman who would tell one that would tell anything. If you have any suggestions, please let us know via our Contact page. Thanks!